This sombrero has an interior band of leather that has a manufacturer's name stamped into it. (However the band is well worn, and the manufacturer's name is still a mystery.) The crown of the hat stands tall (like a mountain...not a point, but definitely a peak). The brim is slightly turned up on either side. 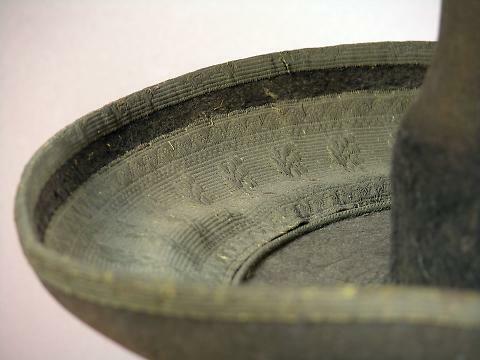 Wide, gray passementerie, approximately 2.75 inches wide, is laid on the top of the brim and stitched flat. 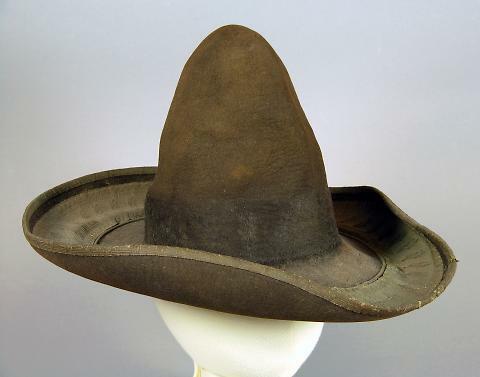 A narrow band decorates the edge of the brim.